One way I can always tell when Walmart is deep into a product rollout is when my store finally receives it. Living in a town of 17,000 – and being the largest city for a 90-mile radius – we aren’t exactly a high priority location for the newest products. I will admit I was bit surprised when running in for some groceries yesterday to spot that we had gotten our iPad display already … just no stock. Yep, that’s the iPad display where our iPods used to be (which have now been moved around the corner), but there are some distinct issues in the face that we have no stock currently. The price tags are all in place for the six different models, but the shelves are definitely bare. 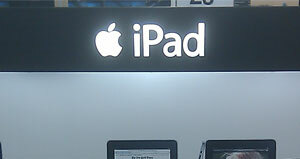 The iPad in the display is also just sitting there blank. Perhaps our video element is coming down the road, but for now it does not make for a very attractive display when you just have a black slab laying there under glass. I do find it interesting how Apple finds a way to carry their retail store design aesthetic over into an environment such as Walmart. You get similar signage, the natural wood coloring, the stark white informational placard, you have to give it to Apple for making sure it’s products are always displayed in the most positive environment. Now … if we could just get some stock. What say you? 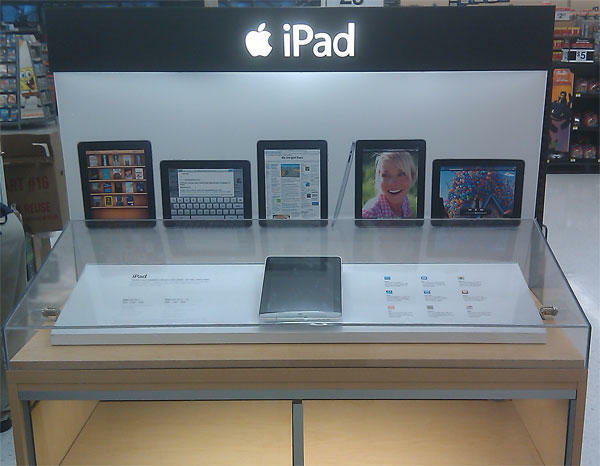 Have you seen the ipad showing up yet in all those retail stores we’ve been hearing about receiving it?